A metropolitan area of 12,000,000 people. TWELVE MILLION PEOPLE! That is one third of the entire population of Canada. Ho Chi Minh City is the most densely populated city I've ever been in. Some days, just walking these streets makes me want to run into a sound-proof booth and slam the door! The noise is DEAFENING! The traffic is CRAZY! The horns are CONSTANT. Motorbikes drive on the sidewalks. Pedestrians are forced to walk in the streets. Most days I can hardly wait to return to our room, rip out my hearing aids and lay down on my bed to rest. We've eaten excellent food. We've walked for miles. And once again, we've met the friendliest people on earth. District 3. A children's playground surrounded by apartment buildings. There was a pretty intense game of soccer going on when we walked by. Street food is the best food. This sidewalk kitchen was a going concern. A residential street at dusk. One night, Joe booked us into a food tour. Its theme was street food. There were three Vietnamese guides, two Danes and three Canadians in our group. Joe and I find food tours an excellent way to get to know a city and its culture. The aftermath of 'com tam'. Su was my driver for the food tour. 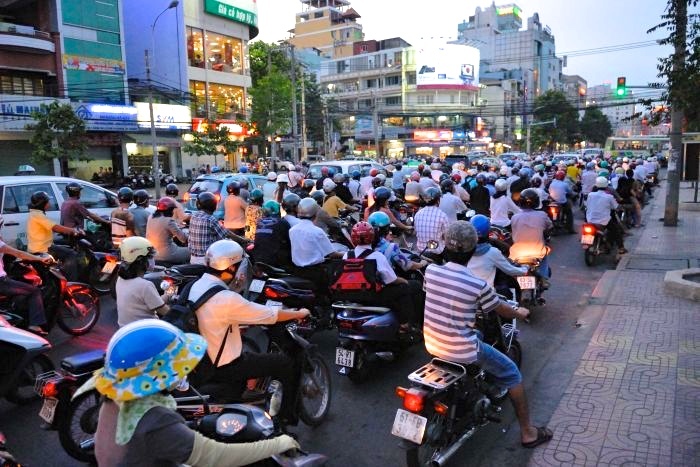 We had so much fun together while she expertly navigated the bustling Ho Chi Minh City traffic. Pictures of 'Uncle Ho' are everywhere. One afternoon we visited the War Remnants Museum. That experience was enough to give me a severe migraine. As teenagers, we watched the Vietnam War play out on our television screens. One of the most powerful photos in the museum shows the aftermath of 'Operation Ranch Hand', the American military's program to defoliate the Vietnamese jungle with the toxic herbicide Agent Orange. 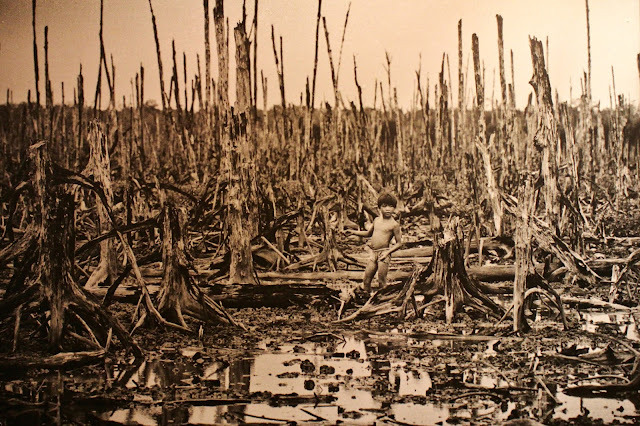 Not only did Agent Orange decimate the landscape, it also caused horrific birth defects in Vietnamese children for generations to come. Saigon breakfast. 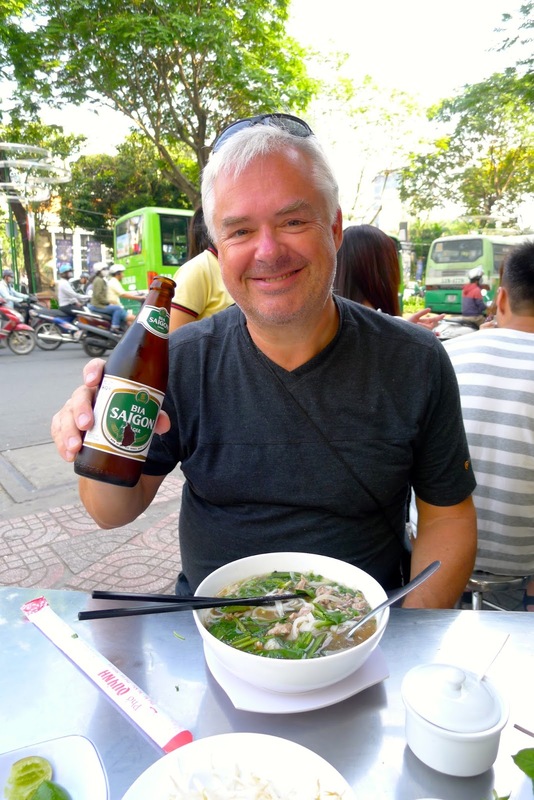 A bowl of pho and a bottle of beer. 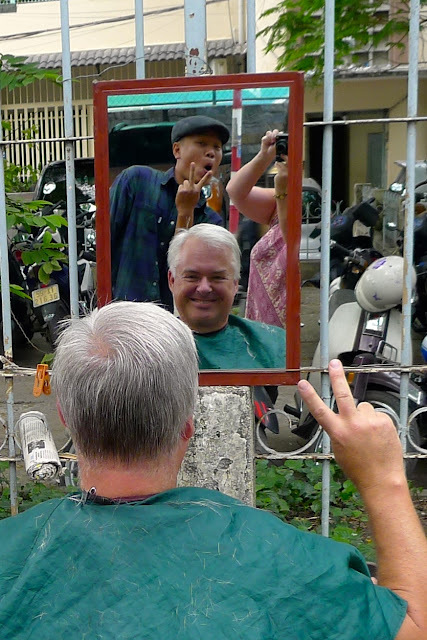 For the month we've been in Vietnam, Joe has wanted to get his hair cut by a street barber. We looked in every city we've travelled to, from the north to the south, and could not find one anywhere. Until yesterday. We came across a man fast asleep in a ratty old barber chair on the sidewalk. A mirror hung on a fence nearby. Joe gave the man a nudge, he woke up, flung a plastic cape around Joe's neck and got to work. People stopped to pose with Joe and take photos. Drivers gave Joe the thumbs up and honked their horns as they drove by. Just as Joe was about to get out of the chair, the barber abruptly reclined the seat and began applying shaving cream to Joe's face. Out came the straight razor and things got serious! The barber shaved Joe's beard, earlobes and unibrow. He trimmed Joe's nostril hairs and run-away eyebrows with scissors. Joe felt like a new man when it was done. All for $5.00 Cdn. Sometimes we felt like giants in this country. When the streets get too congested with motorcycles, the drivers just jump the curb and drive on the sidewalk. No big deal. One of the things Joe wanted to do while we were in Ho Chi Minh City was go to a karaoke bar. Not that we tried super hard, but we didn't have much luck finding one near our hostel. Tonight after dinner, as we were wandering near the Saigon River, we decided to stop at a little place for dessert. And what to our wondering eyes should appear but two women singing karaoke! They quickly got out an English songbook and invited me to join them. We belted out 'Get Back' by the Beatles. Our Vietnamese visas run out in a couple of days. Sadly, it is time to leave this marvellous country. I cannot wait to return. We begin our journey to India tomorrow. I must admit I'm a very excited and also very nervous. I thought our time in Ho Chi Minh City would be good practice for New Delhi. An Indian friend broke the news to me that New Delhi's craziness was 10x that of HCMC. Wish me luck. I'll need it!